The majority of business growth in the coming decades—new jobs and new businesses—will come from services. Editor's note: This is Chapter 2 from "The Connected Company," by Dave Gray and Thomas Vander Wal; cross-reference links to other areas of the book will be broken, as this chapter is excerpted from a larger work. Dave Gray will be speaking about the importance of company culture at the Cultivate training at Strata + Hadoop World in San Jose March 28-31, 2016. In today’s world, where ideas are increasingly displacing the physical in the production of economic value, competition for reputation becomes a significant driving force, propelling our economy forward. Manufactured goods often can be evaluated before the completion of a transaction. Service providers, on the other hand, usually can offer only their reputations. Industrialization is a phase, and in developed nations that phase is ending. Growth in developed economies will increasingly come from services. Great Resets are broad and fundamental transformations of the economic and social order and involve much more than strictly economic or financial events. A true Reset transforms not simply the way we innovate and produce but also ushers in a whole new economic landscape. This economic crisis doesn’t represent a cycle. It represents a reset. It’s an emotional, raw social, economic reset. People who understand that will prosper. Those who don’t will be left behind. The good news is that although resets are initiated by failures—sometimes catastrophic failures, like we have seen in the mortgage system—they also lead to new periods of growth and innovation, built on new systems and infrastructure. There’s little doubt that a fundamental economic restructuring is underway. There will be winners and there will be losers. As we stand on the verge of a new era, it’s easy to disparage the old-school industrial economy. But let’s not forget that the industrial economy gave us an abundance of material wealth we now take for granted, including many things that were unavailable—and unimaginable—in previous centuries. Economist J. Bradford DeLong points out that in 1836, the richest man in the world, Nathan Rothschild, died of a common infection that would have been easily curable with modern antibiotics. In the 1890s, even the richest of the rich could not go to the movies or watch football on TV, and traveling from New York to Italy took at least a week. The material abundance we all enjoy was made possible by an industrial economy that focused primarily on mass-producing material goods. The philosophy of mass production was based on Henry Ford’s big idea: If you could produce great volumes of a product at a low cost, the market for that product would be virtually unlimited. In the early days, his idea held true, but eventually, every market gets saturated and it gets more and more difficult to sell more stuff. By 1960, 70% of families owned their own homes, 85% had a TV, and 75% had a car. As markets became saturated with material goods, producers found a new way to apply the principle of mass production in mass marketing. With a TV in nearly every house, producers had a direct line to customers. Customers became known as consumers, because their role in the economy was to consume everything that producers could make. Increasingly, this producer-consumer economy developed into a marketing-industrial complex dependent on consumer dissatisfaction and the mass creation of desire for the next new thing. New technologies of communication have splintered the channels of mass communication into tiny fragments. It’s no longer possible for mass marketers to reach out and touch all of their customers at once. The megaphone is gone. And with the rise of blogs, social networks and other peer-to-peer communication channels, every customer can have his own megaphone. To many mass marketers, this feels like a chaotic cacophony of voices, and it’s hard to be heard in the crowd. But to most customers, it’s an empowering feeling to have a voice, to be heard. Even if a company ignores your complaint, the world will hear, and if companies don’t respond, they will eventually feel the pain, as customers find new places to go to get what they want. The producer-driven economy is giving way to a new, customer-centered world in which companies will prosper by developing relationships with customers—by listening to them, adapting, and responding to their wants and needs. The problem is that the organizations that generated all this wealth were not designed to listen, adapt, and respond. They were designed to create a ceaseless, one-way flow of material goods and information. Everything about them has been optimized for this one-directional arrow, and product-oriented habits are so deeply embedded in our organizational systems that it will be difficult to root them out. It’s not only companies that need to change. Our entire society has been optimized for production and consumption on a massive scale. Our school systems are optimized to create good cogs for the corporate machine, not the creative thinkers and problem-solvers we will need in the 21st century. Our government is optimized for corporate customers, spending its money to bail out and protect the old infrastructure instead of investing in the new one. Our suburbs are optimized to increase consumption, with lots of space for products and plenty of nearby places where we can consume more stuff—including lots of fuel—along the way. Our entertainment and advertising industries are designed to drive demand and keep the whole engine running. We no longer live in an industrial economy. We live in a service economy. And to succeed in a service economy, we will need to develop new habits and behaviors. And we will need new organizational structures. 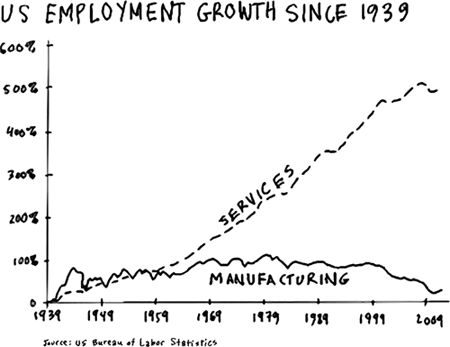 Since 1960, services have dominated US employment. Today’s services sector makes up about 80% of the US economy. Services are integrated into everything we buy and use. Nine out of every ten companies with fewer than 20 employees are in services. Companies like GE and IBM, which started in manufacturing, have made the transition, and now make the majority of their money in services. What’s driving the move to services? Three things: product saturation, information technology, and urbanization. When people already have most of the material goods they need, they will tend to spend more of their disposable income on services. Increasingly, the products that companies want to sell us are optional; they offer not functionality, but intangible things like status, pride of ownership, novelty, and so on. And products, we have found, not only make life easier, but can also be a burden. When you own a house, you have to spend money to fix the roof or the plumbing. Where’s the fun in that? And moving can be a big hassle when you have a truckload of stuff to lug along with you. A recent study found that Great Britain, where the industrial revolution began, reached “peak stuff” levels between 2001 and 2003—long before the 2008 recession—and material consumption has been declining ever since (it’s now down to the 1989 level). A post-industrial revolution is delivering a new kind of abundance: an abundance of information, along with networks and mobile devices for moving that information around, and much faster processing, which allows us to do more interesting kinds of things with the information we have. Think about how you use the Web. While at first this shift was driven by the kinds of things we traditionally think of as information containers, like pages and images, now it has exploded to include many things that were previously undocumented: your network of friends and acquaintances, the things you do, the places you go, the things you buy and what you think about them. Even your random, throwaway thoughts are being captured in Foursquare checkins, tweets, status updates, photo and video uploads, and other kinds of “data exhaust” that you may not even know you’re generating, simply by using your phone and other devices. This digital revolution is ushering in new ways to deliver, combine, and mix up services, resulting in all kinds of enticing combinations: streaming music, following other people’s book highlights, renting strangers’ apartments or cars by the day, negotiating bargain prices from airlines and 4-star hotels, and much more. In addition, there is an increasing trend toward urbanization. Throughout the world, city populations are growing much faster than rural populations. We are becoming an urban society and living more urban lifestyles. Fifty percent of the world’s population today lives on 2 percent of the earth’s crust. In 1950, that number was 30%. By 2050, it is expected to be 70%. Why are people moving to cities? Because cities are where the action is. There are more jobs—and more kinds of jobs—available in cities, and even when the same job is available in the country and the city, the job in the city pays more. Urban workers make, on average, 23% more than rural workers. And the more highly skilled you are as a worker, the more you stand to gain financially by moving to a large city. Also, if you happen to get laid off or your company goes out of business, it’s much easier to find a new job in a city without having to pick up and move. As work becomes more complex and more skills are required, cities become more attractive to companies, too, because that’s where the skilled workers are. Cities pack a lot of people and businesses into a relatively small space, which is good for services companies in several ways. Space: People living in small city apartments just don’t have a lot of room for products, and because they are making more money than their rural counterparts, they tend to spend more on services. Why take up space with a washer and dryer when there’s a laundry service right down the street? Density: Urban density makes it more attractive for companies to provide a wide variety of services. For example, a cable company can wire a city apartment building and serve hundreds of households for a fraction of the cost to do the same thing in a suburb or rural area. Taxis find customers quickly in densely packed urban centers. One city block can support several specialty stores and a variety of restaurants. And in a reciprocal loop, that wide variety of services makes cities even more attractive places to live. Consider the quintessential industrial-age product, the automobile: for many, it is a symbol of individuality, status, personality, and freedom. In suburban and sparsely-populated rural areas, a car provides you with unlimited mobility and choice. But in a densely populated urban environment, a car quickly becomes more trouble than it’s worth. A permanent parking space in New York costs more than a house in many other areas. Density creates demand for more services, like taxis, limousine services, buses, and subways. It also creates opportunities for new services. For example, Zipcar is a car-sharing service that gives customers shared access to a pool of cars located throughout their city. RelayRide and Whipcar are peer-to-peer services that allow car owners to rent their cars to neighbors by the hour or by the day. Uber connects a network of professional limo drivers with city dwellers, who can order a car by SMS or mobile phone app; orders are routed to the nearest available driver, payments are automated, and driver tips are included, creating a simple, easy, seamless customer experience. Cars themselves will increasingly become platforms for delivering services. In 1995, GM created OnStar, an in-car subscription service that offers turn-by-turn directions, hands-free calling, and remote diagnostics. If your car is stolen, GM can track the vehicle, slow it down, or shut off the ignition remotely. But that’s just the beginning. Automakers will increasingly be integrating with digital services, and cars will become platforms for a broad array of apps and services that will help you lower your fuel costs, stream music, avoid collisions, find parking, notify you if friends are near, and a whole host of other things we can’t yet imagine. Ford announced recently that they are creating an open platform that will allow tinkerers and developers to electronically “hot-rod” their cars. And Google is working on cars that will drive themselves. How’s that for a service? If a car can be a service, anything can. Some people argue that the majority of services growth comes from low-wage jobs. But according to the US Bureau of Labor Statistics, job growth will be led by health care, followed by professional, scientific, and technical services, as well as education. GE CEO Jeffrey Immelt, quoted in The Great Reset: How New Ways of Living and Working Drive Post-Crash Prosperity by Richard Florida, (New York: HarperCollins, 2010). “In 1836, the richest man in the world, Nathan Rothschild, died of a common infection…” From “Cornucopia: The Pace of Economic Life in the Twentieth Century” by J. Bradford DeLong. Working Paper, National Bureau of Economic Research, (March 2000): http://www.nber.org/papers/w7602. “A recent study found that Great Britain, where the industrial revolution began, reached “peak stuff” levels between 2001 and 2003…” From “Peak Stuff: Did the UK reach a maximum use of material resources in the early part of the last decade?” By Chris Goodall, http://carboncommentary.com, (October 13, 2011). 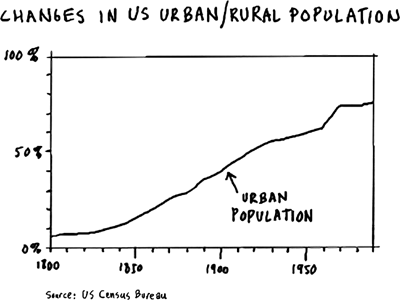 “City populations are growing much faster than rural populations” from US Census Bureau, http://www.elderweb.com/node/2836. “Fifty percent of the world’s population today lives on two percent of the Earth’s crust. In 1950, that number was 30%, and by 2050 it is expected to be 70%.” Projection by the United Nations, http://bit.ly/1VEOO7a. Urban workers make, on average, 23% more than rural workers.… “Explaining the Gap in Pay Between Rural and Urban Work,” The Daily Yonder, March 3, 2008, http://www.dailyyonder.com/explaining-gap-pay-between-rural-and-urban-work. “Wage Gap Widens, Especially in Cities,” by Christopher H. Wheeler. The Regional Economist, January 2005. “A permanent parking space in New York costs more than a house in many other areas.” From “For Parking Space, the Price is Right at $225,000” by Vivian S. Toy, The New York Times, July 12, 2007. “Ford announced recently that they are creating an open platform that will allow tinkerers and developers to electronically ‘hot-rod’ their cars.” From “Hack your car with OpenXC, a platform for modding Ford car computers,” by Dean Takahashi, VentureBeat, September 12, 2011, http://www.venturebeat.com/2011/09/12/hack-your-car-with-openxc-platform-for-modding-ford-car-computers/. “Google is working on cars that will drive themselves.” From “Google Cars Drive Themselves, in Traffic,” by John Markoff, The New York Times, October 9, 2010. “Job growth will be led by health care…” From “Occupational Outlook Handbook: 2010-20 Projections,” Bureau of Labor Statistics, March 29, 2012, http://www.bls.gov/ooh/About/Projections-Overview.htm. Article image: Apis florea nest closeup. (source: By Sean Hoyland on Wikimedia Commons). Dave Gray, SVP Strategy, Dachis Group, is an author and management consultant who works with the world's leading companies to develop and execute winning strategies. His previous book, Gamestorming (O'Reilly), has sold more than 50,000 copies and has been translated into 14 languages. 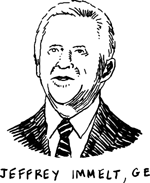 Thomas Vander Wal has been working with folksonomies since their darkest origins, and is credited with inventing the terms 'folksonomy'and 'infocloud'. He talks and writes about folksonomies more or less continuously. Thomas is also on the Steering Committee of the Web Standards Project and helped found the Information Architecture Institute. He lives in Bethesda, Maryland.